One of the best straight compose hockey sticks available in the market, it’s easy to review the Grays GX7000 for players who like less curve in their stick. Many players still prefer the day of the wooden stick and the straight bow shaft bow from Grays is perfectly suited. It also suits juniors who are progressing to their first senior composite stick and haven’t used a hockey stick with significant curve in the bow yet. Though many of the hockey sticks with more distinct bow profiles don’t take long to get used to, Grays address the need of the players with a preference for the straightest profile in the GX7000 Standard Bow stick. With just a 20mm bow position high in the shaft at 300mm up from the ground, the GX7000 from Grays is certainly one of the straightest hockey sticks available. What I like about the Grays GX7000 Straight Bow is how many features and what high specification the technology is within a straight stick. Often you find the brands, particularly the smaller ones, focus all their attention to low bow sticks and the straighter sticks in their range do not get treated to as much technology. I am pleased to review that the Grays GX 7000 is full of features and Grays high-tech advancements that they put in to other lower, more extreme bow hockey sticks. This bow setup combined with the technology makes the GX7000 a great stick for a good club player who is just looking to keep the skills they have continuing at a reasonable standard and not have to change their game to suit a new, different setup of stick. Standard bow hockey sticks from Grays like the GX 7000 are great also for the taller players who need to avoid unnecessary pressure of their back. Available in 37.5” version as standard the GX7000 will feel one of the tallest hockey sticks available because of the Standard bow. On the bottom of the Standard bow shaped shaft, the Grays GX7000 carries the standard Maxi Head which is very forgiving as it has a large sweet-spot and also really maneuverable round the ball. First it provides a slightly softer area on which the ball can be absorbed when receiving at pace. However as it is made with aramid (the material used in bullet proof vests) it also remains tough when striking the ball. Secondly it is slightly abrasive, which provides grip for dribbling skills. This type of technology is found on many hockey sticks, often it is not that great and wears away quickly. Grays isn’t perfect but is definitely one of the best out there. 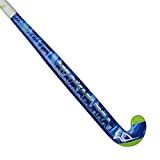 I love the Grays GX7000 Standard Bow hockey stick because I prefer not to have to muck around with one of these crazy bendy hockey sticks. It suits me to just run with the ball and I find it very consistent with passing and hitting the ball. The Grays GX7000 is available in 4 different shaft bow shapes. We have a review of the overall setup of the GX7000 range with details on what is different between them all here on the review of Grays GX7000 hockey stick overview page. Overall the Grays GX7000 Standard bow a great stick that would do a fantastic job for the taller player, those who prefer a straighter hockey stick or a junior who hasn’t had a particularly curved stick in the past and is moving in to the seniors. You probably won’t be drag flicking the winner in to the roof of the net but with an easy to play with setup you will be consistent with your passes. Combined with lots of great technology features found in top end Grays sticks you will have a good solid stick that will last you well.